Donkey Kong (ドンキーコング, Donkey Kong) is an arcade game released by Nintendo on July 9, 1981. It was designed by Shigeru Miyamoto and was one of the first games he produced for Nintendo. It was the first appearance of Mario, back then known as Jumpman, the first appearance of Donkey Kong and the first appearance of Pauline, the damsel-in-distress. This game appears as a Masterpiece in Super Smash Bros. Brawl and Super Smash Bros. for Wii U. In Brawl, it can be played for 30 seconds and starts at 75m. It must be unlocked by having the game turned on for 10 hours. In Smash Wii U, it can be played for 120 seconds and is available from the start. 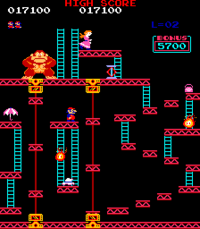 Mario and an early portrayal of the Donkey Kong character debuted in this game. Donkey Kong kidnapped Pauline, and Mario had to rescue her. The stage 75m comes from this game. It is the third level in the original arcade version, and the second one in the NES version. The Hammer comes from this game. When grabbed, Mario swings it around and instantly defeat any enemy he touches. However, he can't jump while using it. "Donkey Kong", "Opening (Donkey Kong)" and "25m BGM" come from this game. "Donkey Kong" is a remix of the 25m level theme. "Opening (Donkey Kong)" is a remix/medley of several pieces of music from Donkey Kong. Starting off with the track that plays during the opening in this game, then the soundbyte that plays during the 'Game Start', the 25m level music and the music that played when Mario picks up and starts flailing the Hammer. "25m BGM" is the original version of the 25m level theme. Some platforms in Mario's and Donkey Kong's Target Smash! levels in Super Smash Bros. Melee resemble the platforms in this game. Mario's down taunt in Brawl, SSB4 and Ultimate is based on his death animation from this game. This page was last edited on March 14, 2019, at 21:32.